Webelos can sign up here. 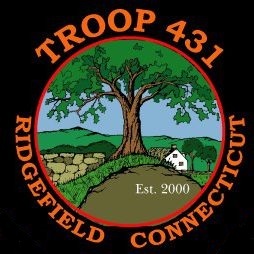 Webelos I & Webelos II scouts are invited to join Troop 431 in Ridgefield, CT for a unique opportunity to earn three Webelos Adventure Badges in one day. For Webelos parents, we will be presenting an overview of Boy Scouts and Troop 431 during Session I. For more information, please contact Al Badinelli, Troop 431 at weebelosadventurescollege@gmail.com. Registration: Completed registration forms and fees are due by January 5, 2019. Space is limited to 100 Webelos and registrations will be accepted on a First-Come, First-Served Basis. Advance registration required. CLICK HERE to be taken to the registration form. Completion Certificates: Upon completion of each session, Webelos will be given a completion certificate signed by the instructor indicating the requirements that have been completed. In some cases not all requirements will be completed. The completion certificate should be presented to your Den Leader who can submit the award through your Pack’s Advancement Chairman (Advancement must be submitted through your Pack; Troop 431 cannot submit advancement on behalf of the Pack). Parents Session: During the first session, until approximately 10:30 a.m., we will be conducting an optional parent’s session while the Webelos are in class. During this informative session, we will provide Webelos parents with an introduction to the Boy Scout program and discuss the differences between Boy Scouts and Cub Scouts. We will also be presenting a slide show of Troop 431 activities and summer camp to give you an idea of the exciting activities that Boy Scouts participate in. This session will be especially informative for parents of Second Year Webelos whose scouts are considering crossing over to Boy Scouts in the next few months.